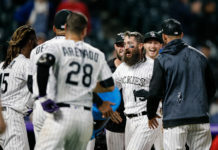 The Colorado Rockies faced off against the Los Angeles Dodgers over the weekend with ESPN’s flagship program, Sunday Night Baseball, returning to Coors Field for the first time since 2001. Although the Rockies were slaughtered on national television, there was a positive that came from the ESPN crew coming to the Mile High City. During warmups ahead of Saturday nights game, Rockies’ shortstop Trevor Story caught up with former player-turned-broadcaster, Alex Rodriguez to chat baseball, routine and life in the big leagues. Rodriguez was out at the yard a day before the broadcast getting the lay of the land and spent a few minutes on the steps of the Rockies’ dugout sharing some insight with the young infielder. During his heyday, Rodriguez was one of – if not the – best player in all of baseball. A-Rod’s career spanned 22 seasons with three different clubs, including the Texas Rangers, the team Story watched most growing up. Over the course of the past three seasons, Story has evolved into one of the best two-way shortstops in the game with the ability to play surefire defense and provide serious pop in the middle of the lineup. Like Rodriguez, Story has developed a reputation around the league for being a power hitter and consistent home run threat. 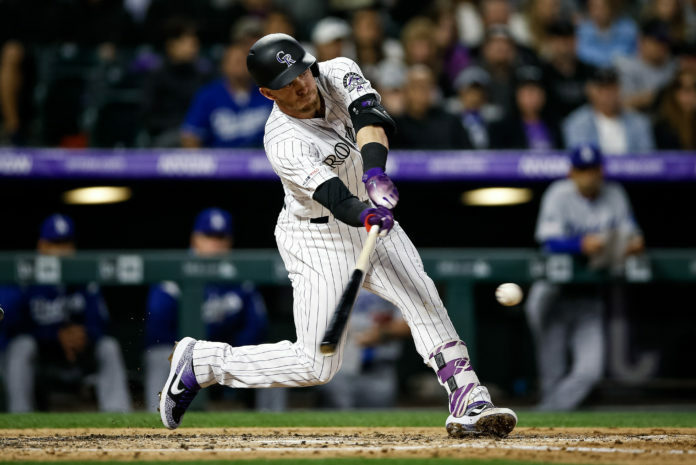 So far in his career, Story has blasted 91 home runs and hit the second most in the National League last season with 37, trailing only Nolan Arenado for the league lead. Chatting with the 14-time All-Star was a dream come true for Story who picked up some confidential information from Rodriguez in their chat. While the conversation has been kept quiet, it’s clear that Story gained some useful insight from the chat. Story is still a ways away from becoming a player of the same caliber as Rodriguez, but he is certainly ascending to become one of the best shortstops in the game. At 26-years-old, Story still has time to grow and mature as a player following his strides thus far in his career. This season, Story has emerged as one of the leaders within the organization and a leading voice of the team. 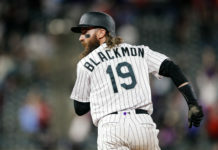 The 2019 season is not off to a great start for the club, but Story has stepped up as a leader and has developed into a spokesperson for the media within the Rockies clubhouse following tough losses. The conversation between Story and A-rod represents mutual respect between one of the best to ever play and a rising star in the game today, paying homage to the potential star the Rockies possess.